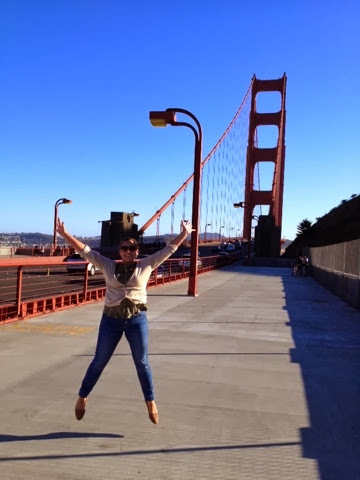 After a week in Las Vegas, I was excited to see San Francisco. A few people had told me that it reminded them of England in terms of the weather and some of the architecture. Plus I needed a little bit of reality after being in the crazy word of Las Vegas. We checked out of our hotel and decided to watch the England football match before our 5pm Greyhound bus. My boyfriend booked an overnight bus for us to San Francisco that would take 14 hours and cost us $38 each. I have only done one overnight bus before and that was Byron Bay to Sydney, which also took the same amount of time. Only this time I was prepared with socks, a hoody and a scarf; as my previous experience left me freezing for 14 hours and unable to sleep. Turns out this journey wasn't too bad, after a change over in LA, we arrived in San Francisco where we took a cab for $10 to our hotel (/brothel, don't ask!) on Columbus Street. We weren't able to check in until 2pm an so we dropped our bags off and headed out for the morning. 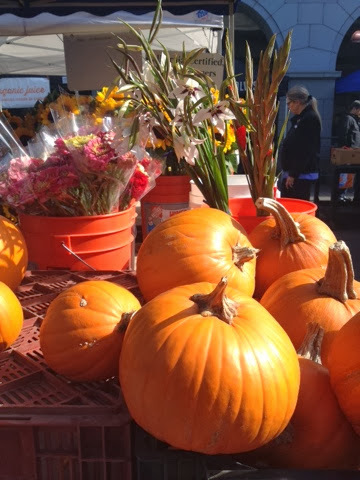 Stopping at a local coffee shop, for a good old English tea, we decided to start our day with the local Farmers Market that some of our friends had recommended to us. The place was amazing, filled with fresh fruits, vegetables, meats and preserves. The colours, smells and sound of happy people were a peaceful and happy start to out adventure in San Francisco. After walking around and sampling some tasty food, we then walked down from pier 1 to go to the famous pier 39. 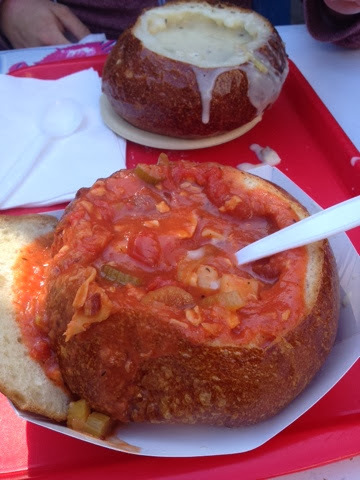 Here we enjoyed a traditional San Francisco, Clam Chowder in a huge bread bowl. 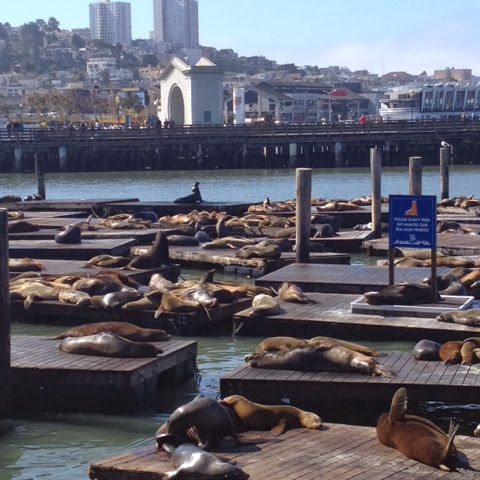 Then we went to pay a visit to some famous San Francisco residents, the sea lions. Splashing and play fighting, we stood here for a good 20 minutes in awe of them. Sad but true, haha. Later on that evening we met up with some friends from our home town of Nottingham who are also travelling the west coast and watched the free firework show on Pier 39. 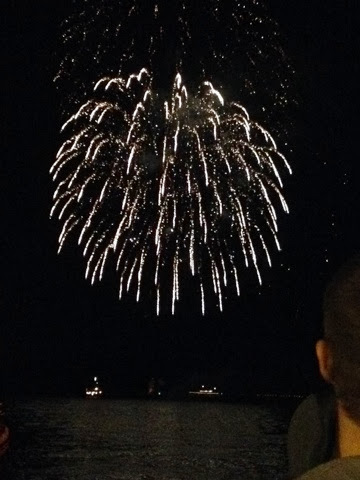 Seeing the twinkling lights explode above Alcatraz was pretty amazing and another highlight to our trip. The next day we decided to take it easy and take a peruse around the Union Square and some of the shops there. You will also find a giant AMC cinema located just off 4th, incase you wanted a cheap evening watching a movie. Later on that day, we met up with the same group of friends from the first night and decided to take the Bart train to Mission. This area is also known as the Mexican District and here you will find a range of amazing places to eat a drink. We went to a bar called El Rio that was hosting a free comedy night and also had $1 PBR beers & $3 dollar whiskey chasers. Safe to say we had our fair share as we sat out back under the twinkling lights and enjoying their BBQ and home made tortilla wraps for $5. It was all pretty amazing, despite the horrendous hangover I had the following day for our 8 hour bus journey to Los Angeles. We arrived at Union Station around midnight and decided to take a taxi to our first hostel on Hollywood Boulevard. As this was after midnight, the 20 minute journey needed up costing us $40. Usually we would have taken the bus ($1.25) but we wanted to be safe, as LA can be a little intimidating at night. When pulling up to our hostel, Hollywood Youth Hostel, it turned out that we were staying right opposite the Kodak Theatre and bright lights of the Hollywood walk of fame. People book their months in advance and watch from the second and third floor balconies as the stars turn up in their fancy designer gowns for the annual Oscars. After what felt like forever to get to bed, we passed out until 11am the next morning. We then began I walked down the Hollywood walk of fame and to the Chinese theatre where I put my hands in the hands of Marilyn Monroe and my shameful Twilight crush of Robert Pattinson. You also have a pretty good view of the iconic Hollywood sign from levels 2 and 3 of the Chinese theatre. Later on that afternoon we decided to take the number 2 bus for $2.25 (or $6 unlimited day pass) for a 45 minute drive to the luxury Bel Air and *queue Pretty Women voice* Rodeo Drive (baby) area. Strolling past the million dollar homes, we finally approached a street filled with affluent designer store and exotic cars. On the way back, we stopped off on the notorious rock and roll scene known as Sunset Boulevard. We had all the intention of going to the Motley Crüe favourite, Whiskey-A-Go-Go but we missed our stop and ended up going for food and drinks near the House of Blues and Saddle Ranch Chop House. 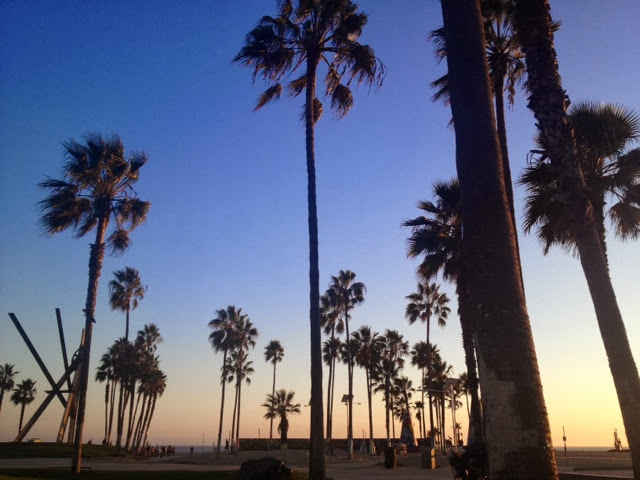 The next day, we checked out of our hostel and headed for Venice beach. LA is a HUGE city and for anyone who has been it takes around 4 hours to drive from one side to the other. As a result of this private transport (taxis) is very expensive. However, I highly recommend a private service called Hostel Hoppa. Prices vary based on your location (for example: San Diego = $40 LAX Airport = $20). Our driver picked us up from right outside our hostel in an air conditioned mini van that had free wifi. 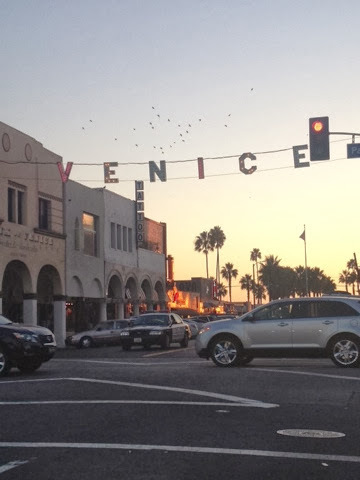 We picked up two other travellers on the way and drove 50 minutes over to our Venice Beach Hostel for $10 each (or $15 return). We stayed at the SameSun hostel in a private room for £30 each a night (through Hostelbookers.com) and the location is right on Venice Beach. From here it's a 30 minute walk to a Whole Foods supermarket and we bought food for the next 3 days that we were there. Although, there are so many restaurants, bars and cafés along Venice Beach if you don't want to cook your own food. 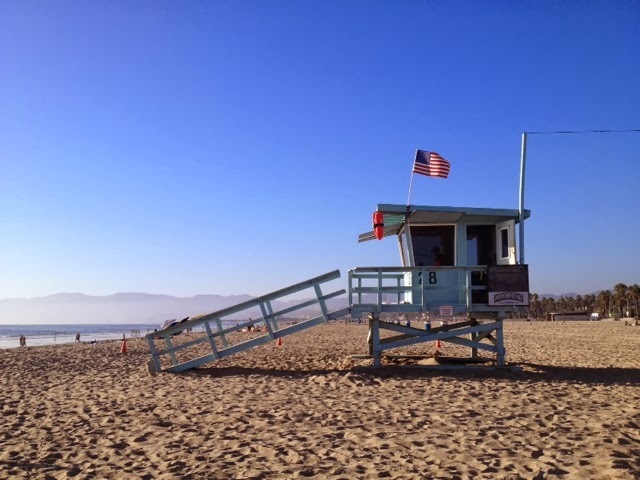 Over the next few days we relaxed on the beautiful beaches of Venice Beach and Santa Monica and soaked up the laid back California atmosphere. Most evenings we spent exploring the a range of cool bars around the Venice beach boulevard area, my favourite was one called Larry's and was lit entirely by fairy lights. Whilst in America, we wanted to also embrace their patriotic sporting culture. Unfortunately, the basket ball season won't start back up until we return to New York in January; however we still had baseball and American football to go. In NYC we checked off baseball from our list when we watched the Yankees win the White Sox; yet it seemed that finding tickets to a football game was more difficult than we though, as we seemed to unintentionally travel on weekends. So when we heard about a high school game being playing by Venice Beach High School against Hollywood High School we jumped at the chance. For anyone who has ever been to America you will know that high school football is also an extremely popular and supported sport. Our tickets cost us $7 each an it was a great experience. Kids and parents had a home made bakery stand with cupcakes and treats for $1 and you could also purchase soft drinks and slices of pizza for a similar price. 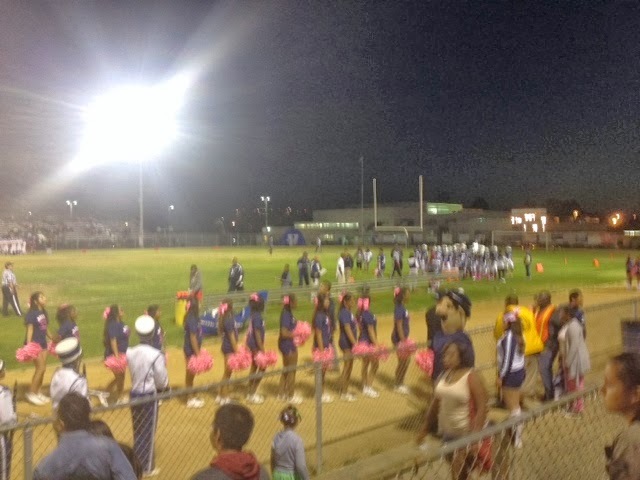 Although probably my favourite part of the game was watching the cheerleaders and brass bands support their teams with cheer-off's against the competing team; adding more and more authenticity to the game and what I imagine a life at an American high school to actually be like. I would highly recommend going to one of these if you get the chance. Like most of our transportation around America, we took a discounted bus, Tefusa, from downtown LA and into San Diego for $25. For anyone paying a visit to LA, please be careful of downtown LA area. It's certainly not a place I would would be alone and I was thankful to have my boyfriend with me. Anyway, we arrived late into San Diego as we missed out first bus and we checked into our accommodation, Hostel on 3rd which is was brilliant. 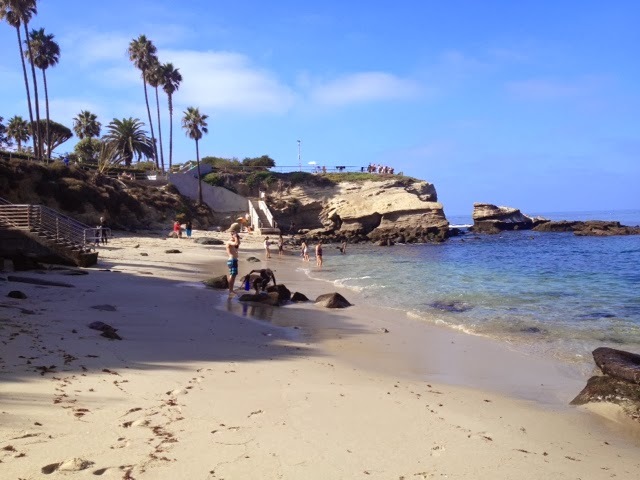 Located in the Gas Lamp area of downtown San Diego you were able to walk to the Marina or local supermarket, Ralph's and you could take a bus for $2.25 to the beautiful beaches around San Diego. Our first day in San Diego was spent picking up food for the next few days and later on thy afternoon we took the (number 30) bus to a beautiful place called La Jolla. Here they have beautiful beaches, boutique style shops and an underwater museum. What is this?? I hear you cry! Well it is basically, a cove where wild sea lions and different types of fish swim in and you can swim with them for free. 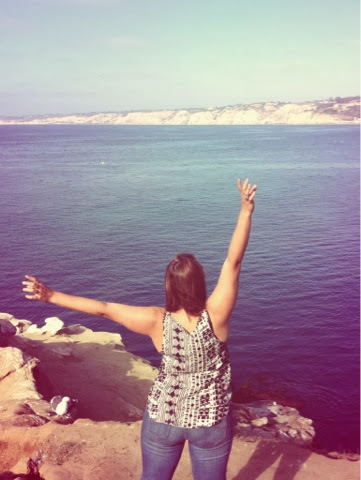 The cliffs are covered in exotic birds, seagulls and sea lions; it's truly amazing and definitely worth a visit it you're staying in San Diego. 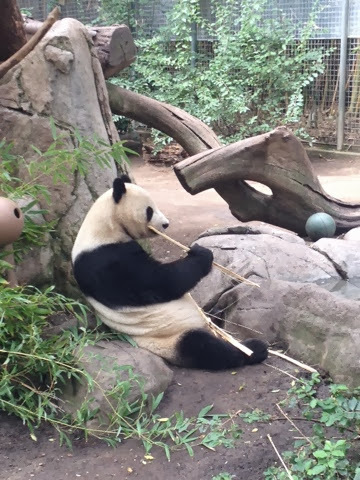 On our final day in San Diego we paid a visit to the San Diego Zoo and in all honesty I wasn't that impressed. The baby panda was cute and it is a large fun zoo, but it is also very expensive. We paid $44 for a basic day pass as we could not find any cheaper online discounts. 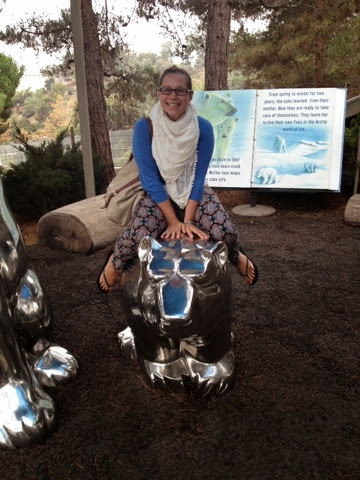 However, I much preferred Lincoln Park Zoo in Chicago, which is nearly as big, has very similar animals and is FREE! A new travel adventure in Central America! So after eight weeks of travelling, #ETLUSA has now come to an end until we fly back to New York in January. I've loved my time in America and there is so much more of this amazing place that I would love to see. Our next stop is Mexico and Central America, so I will be using a new adventure hashtag of #ETLCA! If you have any helpful tips and advice on Central America then please tweet me @eattravellove using the hashtag #ETLCA!